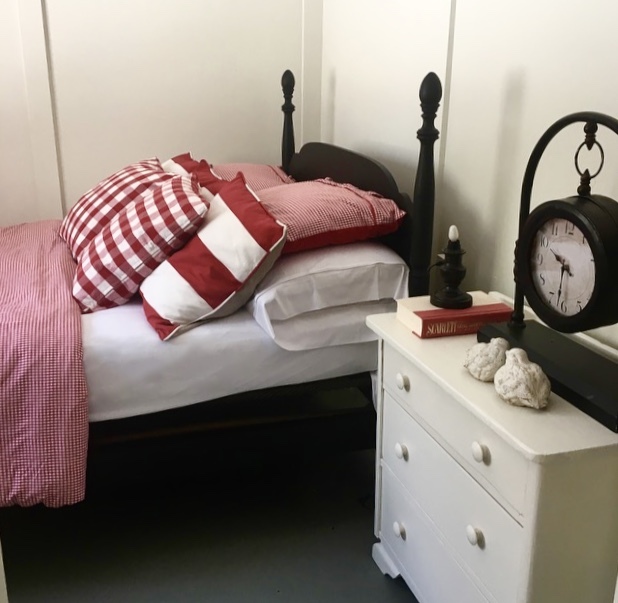 Yesterday, I announced a makeover project I have in the works, "The Blog Cabin". If you missed that post, please click here for the story. Murphie and I headed up to the cabin a couple weeks ago and met my mom and sister for a weekend of cleaning and organizing. It was fun to see the space begin to take shape just by clearing it out. I spent a few days there dreaming up design ideas. The first items on my To-Do List include some labor intensive projects. I realized that in order for me to balance this extra weekend work along with taking care of my family and running the design studio during the week, that I'll have to fit in some quality rest while I'm there. 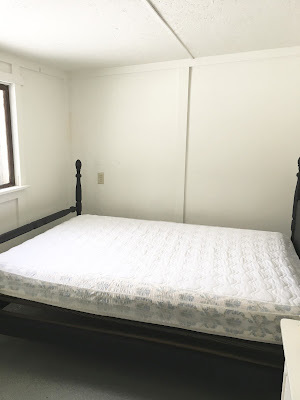 I decided the very first night that I had to establish a restful, peaceful sleeping environment before I even thought about starting any of the bigger projects. In order for me to tackle these projects with my "A" game a good nights sleep is a must. 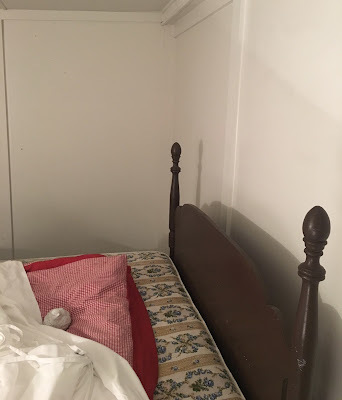 The next morning, after my coffee, I got to work on the bedroom. I drove into town to visit the local hardware. I found a warm, soothing white paint color to freshen up the walls and ceiling ("Wedding Cake" from Ace Hardware) and grabbed some painting supplies. I headed back to the cabin and got busy painting the entire bedroom. 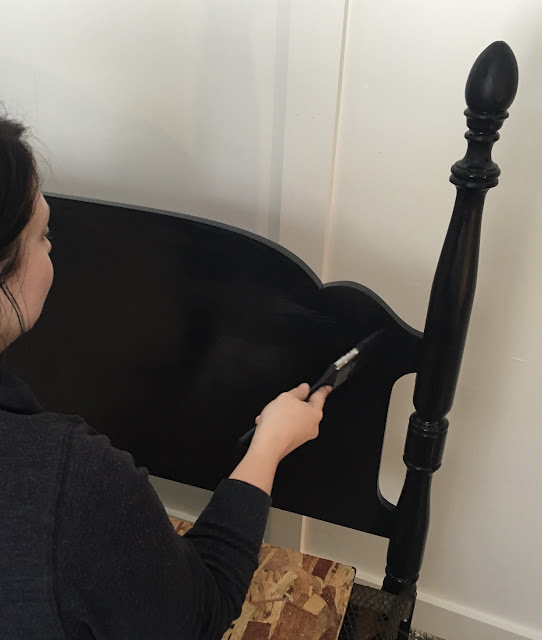 I asked my mom to whip up her recipe for homemade black chalk paint to give the existing vintage bed a new look. (Here is her recipe: Stir together 1-1/2 cup black latex semi gloss paint, 1/2 cup water, 1/2 cup Plaster of Paris mix). Once the paint was ready, I put my sister to work painting the bed. I headed home and began to put together a sumptuous bedding ensemble to create a bed geared for ultimate relaxation and rejuvenation. The Luxe Performance Collection sheet set is absolutely amazing. These sheets feel unlike any sheets I have ever felt before. They are incredibly soft and silky and have a feeling of coolness upon touch. If you're like me and love the feeling of cool sheets, these are for you. They are temperature regulating, cooling sheets that are breathable and moisture wicking. 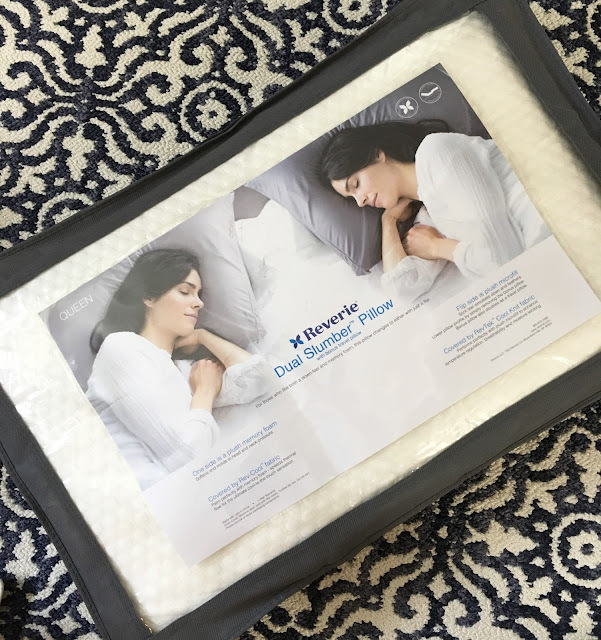 For pillows, I selected the Dual Slumber Pillow. These pillows combine the gorgeous look of a high loft down pillow, with the feeling and comfort of a memory foam pillow! One side of the pillow is memory foam covered with cool to the touch fabric. The flip side is plush micro-fill that simulates down and feathers. Once an insanely comfortable base was established, I layered on the duvet and pillows. Instead of shopping for new, I pulled items from my stash of seasonal home decor. 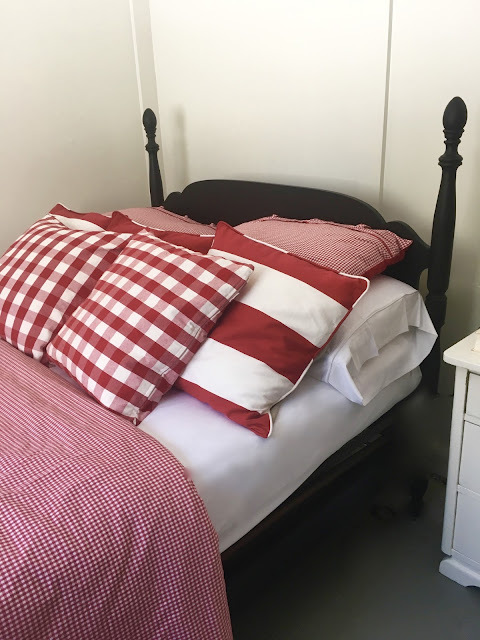 I went straight for red buffalo checks and stripes to create a fresh, crisp, cabin theme. Next to the new black finish on the headboard, it really depicts the simple, but striking "Contemporary Cabin" look I'm going for. I found a small dresser in my mom's storage area and gave it a quick coat of the same paint I used on the walls. I placed it next to the bed to use as a nightstand. 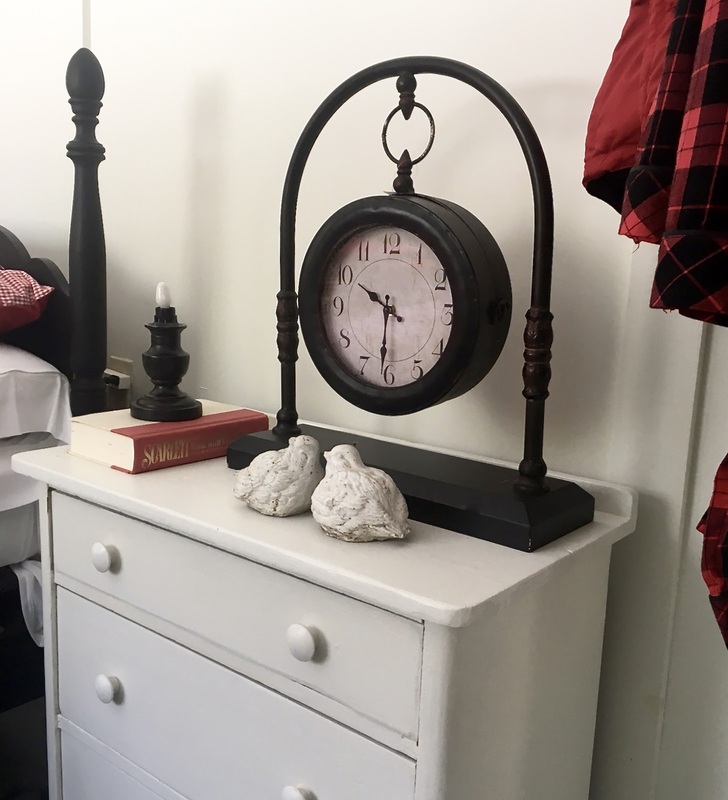 I styled it with a vignette of thrift store finds, an oversized clock from Homegoods and a small night light. 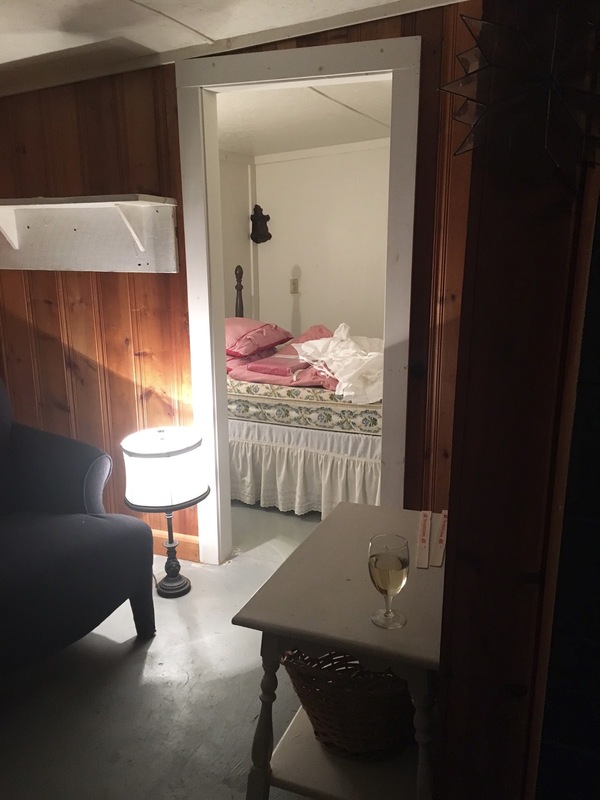 Now that I have a warm, cozy, luxuriously comfortable place to rest, I can wake refreshed each day I'm at the cabin ready to work! Truth be told, I may actually sneak up there on occasion just to sleep in this bed ;). 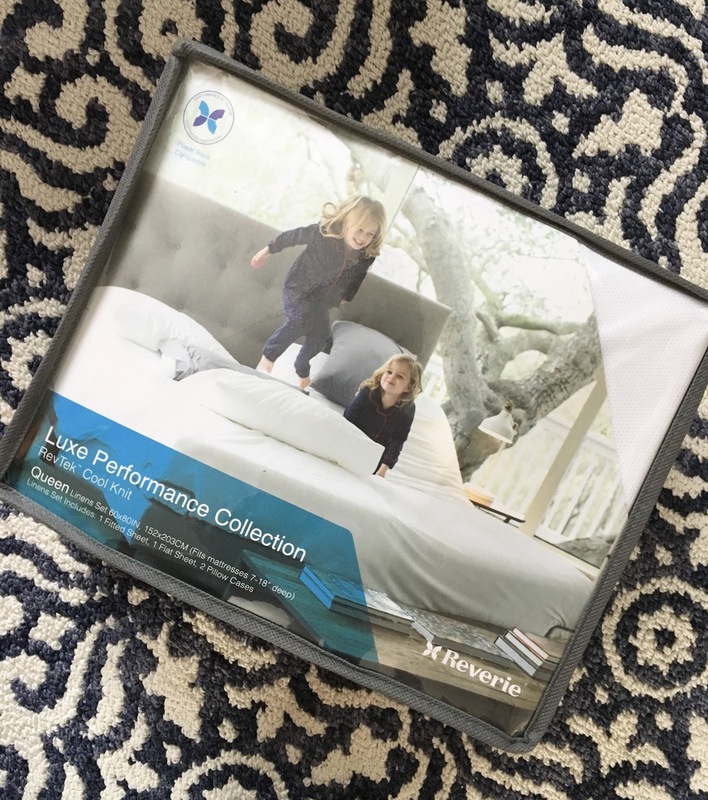 *Thank you to Reverie for kindly sponsoring this post. All opinions are 100% honest & completely my own.